The Honeymoon Grille from Jegunda’s list turned out to be pretty good and there are only two more places on the list we have not been to so we find ourselves crossing off another. 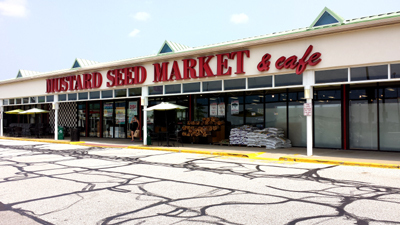 I have been near the Mustard Seed market but have not wandered inside. I have nothing against organic food (which legally doesn’t mean much) and am not averse to eating healthy (sometimes). What worries me about places like these are the people. It’s a good thing I didn’t check the website before we went to see the enormous quote, “Together, We’ll save the world, one bite at a time.”. I don’t know if I could have brooked such a grandiose sales pitch turned sanctimonious sermon, but hey, the only way to ruin stereotypes is to spend some time with different people. Fortunately, we weren’t scanned for verboten substances like anti-biotics, hydronated oils, aspartame, bleached flour or high fructose corn syrup having been previously ingested and we were allowed inside. 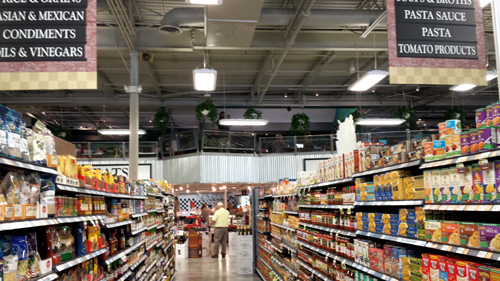 The café sits above the rows of organic this and that and is better put together than I had expected. 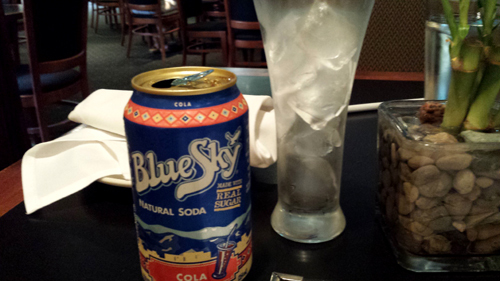 Our server actually did a fair job during our lunch but a side note to the hostess. If you are going to spend all day long telling me the harmful things they won’t allow in your food, I don’t need to watch you pick your teeth for five minutes and then fondle the menus and glasses. Mmmmm…Healthy & Delicious! Onward with eating to live forever. 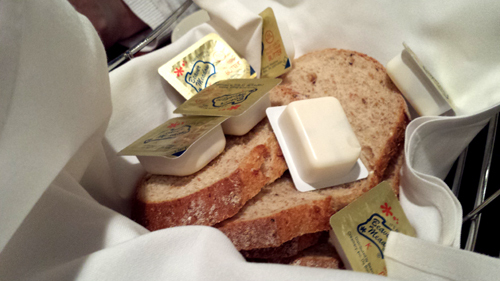 We were delivered a basket of thinly sliced multigrain bread and real butter (yeah for organic living). The bread was unbelievably fantastic with notes from seeds to nuts to crispy brown crust and there is little better on the planet than butter, much of which isn’t allowed here. The first plate out was a bowl of their Thai Peanut Carrot Bisque. Constructed from organic carrots, peanut butter, coconut milk, ginger, crushed red chili flakes and fresh cilantro, this is a signature dish for a reason. 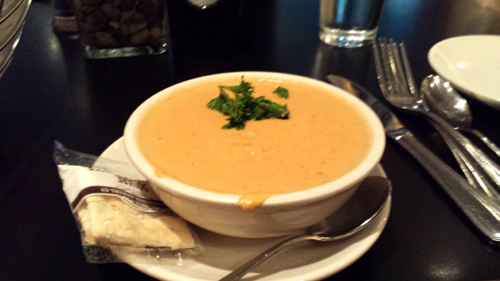 The not quite smooth “bisque” starts sweet from the carrots and quickly turns nutty then spicy. Bite after bite the procession continues, the spice never overcomes the next spoonful of sweet to nuts. 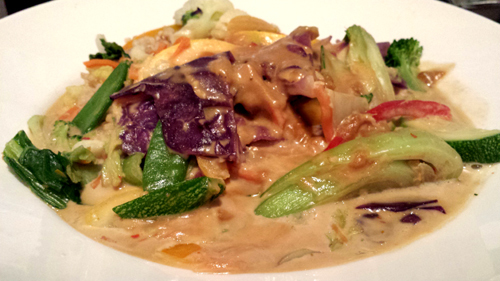 Steph ordered the Thai Peanut Bowl with squash, zucchini, snow peas, cauliflower, napa cabbage, peppers, carrots, onions and broccoli in their house Thai peanut sauce served over brown rice. Where the soup had fabulous layers of spice the bowl lacked everything from salt to peppery spice. The vegetables were done well but the bowl was lacking past those. 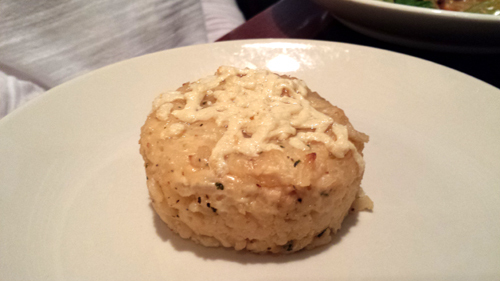 She added a risotto cake which the menu said was filled with mozzarella and served with oven roasted plum tomatoes, artichokes and a smoked garlic fresh herb cashew creams sauce. Outside of the cheese, none of that happened. This hockey puck was shrieking for texture or acid to cut the mushy richness and there was a load of herbage reminiscent of dill, which didn’t help the texture and same unremitting richness. What Happened To The Flavors From The Soup? Good Veg Though. 1. Rich-Ehhh, 2. Rich-Cloying...I Dare You To Take More Than Two Bites. 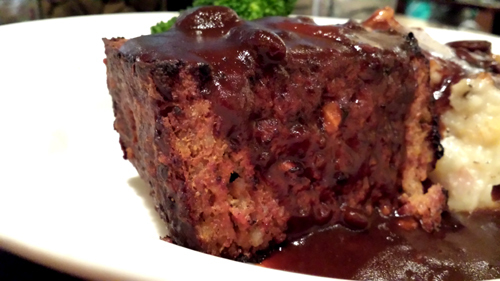 I ordered the Bison Meatloaf with mashed potatoes, steamed broccoli and a mushroom gravy. To start with the simple the mash was stone cold and had leached the heat from the now gloppy gravy. Booo. 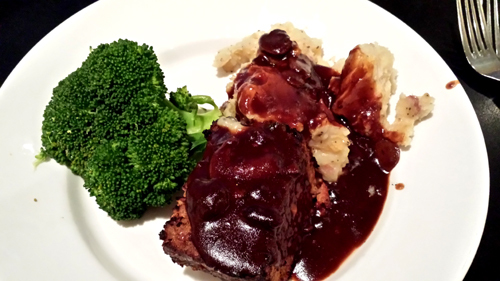 The broccoli was nicely steamed but I was really looking forward to the lightly gamey but beefy bison. I’m not sure what the preparation is for the meatloaf but the result is a textureless and weirdly sweet cake. I certainly wouldn’t bother again. There was one more signature dish on the menu and we had to give it a go. A wedge of their bakery’s carrot cake with carrots, pineapple, walnuts the mandatory cream cheese icing arrived and it appears signature is the way to go at the Seed. 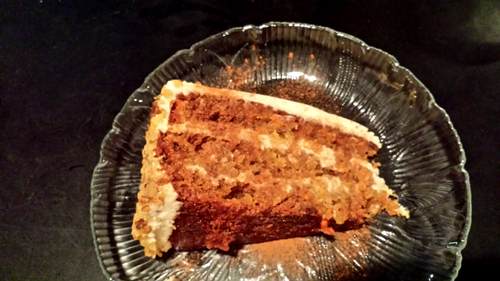 Less frosting than Primo’s but easily the most moist and stupidly delicious carrot cake I have ever had in a restaurant. Just how healthy it is remains up for debate but stick to the signature dishes at The Mustard Seed Café and you might get out alright.